Your roof is your commercial building’s first line of defense from the elements. It’s also one of the most vulnerable components of your property. Every day, its exposed to weather and other conditions that contribute to decay and deterioration, making the risk of damage to the roof itself and the contents underneath it higher. The International Building Code (IBC), which sets safety standards for commercial building, requires that roofs “serve to protect the building.” Having a good roof that protects your building begins with good design, quality materials selection, and proper installation when a facility is built or remodeled – something that doesn’t occur frequently and will probably be outside the scope of most business owner or property manager’s ongoing activity. It will also need a regular routine program of inspection, maintenance, and repair – things that should be part of your yearly operational planning, to prolong the lifespan of your roof and ensure it does its job in protecting your business, inventory, belongings and personnel from weather damage. Here, we’ll help you focus on how to recognize and address common issues in order to stop problems before they begin and fix them before it’s too late and they turn into bigger and more expensive repairs. If it’s been some time since you’ve had your commercial flat roof inspected, the first item on your agenda should be to locate and fix any major issues. Signs of serious problems could be showing themselves from inside your property. Water stains on a ceiling might mean you have a leak, which could be caused by a crack or hole in the membrane of your roof. You must understand – even the smallest leak can be a sign of bigger problems. Also, if your building has mold or odd odors inside that can’t be explained, it could mean a roof leak causing moisture penetration. While water damage or mold on the interior could mean trouble above, you’ll also need to visually inspect the roof itself to locate problems that could get worse as time goes by. 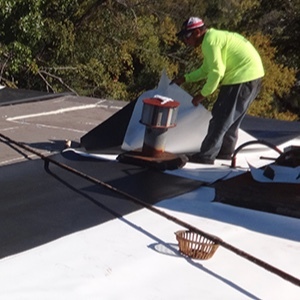 Visual inspections can sometimes be done by the building owner or property manager, depending on the ease of access, but in most instances, you should hire an experienced, professional commercial roofing contractor to make sure its done safely and correctly. Even if you are hiring a professional, reviewing the problems identified in this article may help you to understand the importance of what they have found and the need for taking action immediately. Prolonged ponding or standing water on your flat roof can lead to deterioration of the cover, which, in turn, will lead to leaks. Leaks that go undetected will slowly rust steel roof decks, rot wood decks, and turn light weight insulating concrete and gypsum decks into a thick paste like substance. Also, standing water can lead to a significant addition of weight on the roof, which can weaken and damage the roof deck. Bubbling could be an indication that there is trapped moisture under and within the roof cover, which also can lead to leaks, shortening the lifespan of the roof’s cover, prematurely aging the deck, and reducing the roof cover system’s ability to withstand uplift forces you’ll get with a severe wind storm. Another cause of bubbling on a flat roof is the release of gas from insulation boards that gets trapped below the cover. A roof cut or moisture survey of the roof cover can be done to help in diagnosing this issue. Roof flashing, the strips of metal or other material installed around the perimeter of the edge where the roof cover meets the wall, is also installed around objects. Objects like rooftop equipment and other items that protrude from the roof. It deflects moisture away from seams and joints. A gap in the flashing or roof cover perimeter increases the chance for roof cover failure during severe wind storms, water intrusion or mold formation. For more info, including flashing repair and replacement instructions, please check out IBHS’ resources for evaluating coping and flashing. Tearing of the roof cover, or worn, cracking seams, can also allow moisture to get below the cover. If you have a lightning protection system, make sure its secure and not detached. If it comes down, it can lead to a tear or puncture in the roof covering, especially during strong winds. A lightning protection system with disconnected metal cables or aerials not capable of providing the protection for the building’s occupants that it was intended for. If you have skylights on your building, they need to be checked that they are secure also. Skylights that aren’t sealed and secured around the frame’s edge securely will leak, causing the skylights to become dislodged and allow for wind driven rain and maybe some debris to enter your property during a storm. Also, be aware that as time passes, the plastic domed panels will get brittle and become susceptible to cracking. 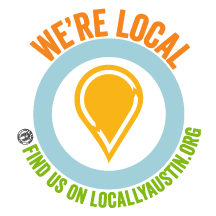 Armadillo Roofing & Exteriors (512) 333-7663 is a flat roof repair contractor and flat roof installation company serving Austin, Texas and the surrounding Austin, TX area cities, including Leander. We have been providing quality professional roofing services since 2001. 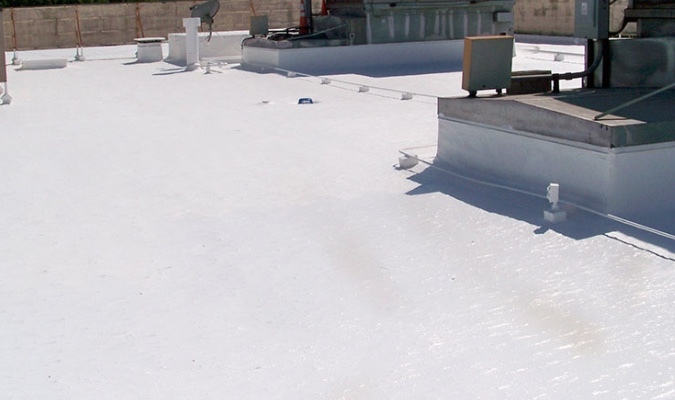 When you have questions about the maintenance or repair of you commercial flat roof, give us a call.